August | 2015 | cut it out, stitch it up! McCall’s M6696 Shirtdress, My Make for the ‘Made Up Initiative’. Readers of ‘Did You Make That?’ will already know all about the ‘Made Up Initiative’ an the aim to raise funds for the National Literacy Trust. Pop over to Karen’s blog for all the details. I’ve set myself the challenge of making up the McCall’s M6696 shirtdress. I’ve been wanting to make this for a couple of months now but sewing has been slow over the summer. I normally sew after the children have gone to bed but with it being the summer holidays they’re going to bed later and if I don’t get downstairs until nearly 9.30pm after ‘just one more story…’ it seems just too late to be getting the machine and everything out. The deadline for the challenge is the 10th September, I’ll be away from home for one of those weeks but I think I can get it done in the time. I had read warnings about the dress having a lot of fullness in the back. 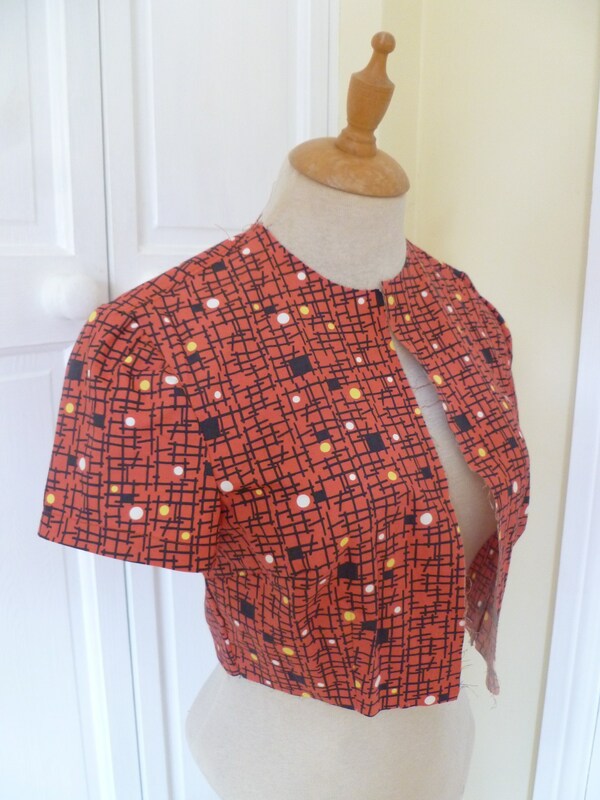 Chris at ‘Make & Wear’ had previously used this pattern and mentioned that with a crisp fabric it may need looking at. I planned to change the gathers into an inverted pleat and wasn’t going to bother with a toile. Luckily I did decide to toile and made a sleeveless bodice and included the waist band. The inverted pleat idea didn’t work at all and it just opened up and ‘blousoned’ out. I decided to make the dress with a flat back, which meant I needed to add in back waist darts. I checked carefully that the top edge of my adjusted pattern was the same length as the back yoke and that when I added the darts the bodice matched up with the waistband. The pattern calls for 2.2mts of 150cm wide fabric, I had 2mts and didn’t think to check the layout first as I seem to think all pattern layouts are more than required but not this time. And I had even shortened the skirt by 6cm. I didn’t follow the suggested layout either but I just managed it, one of the pocket bags has a join in it but nobody will ever see. I’ve sewn up the bodice and inserted the sleeves. My word – those sleeves have a lot of ease! I got there in the end and I think that it helps that it’s such a busy pattern as there is a teeny tiny pleat in one but I couldn’t face trying to sort it out. 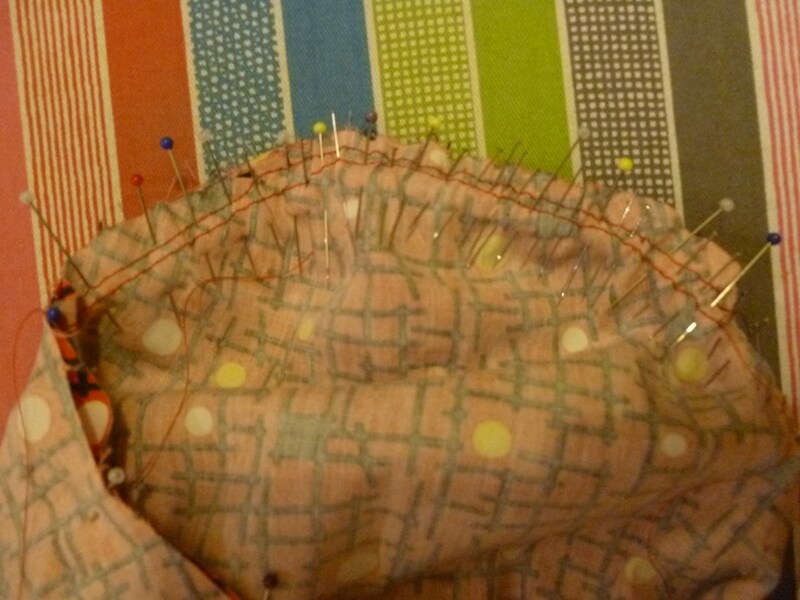 My method of easing in the sleeves is to pin at the underarm round to the notches and at the top then spread the ease out, I also used two rows of gathering stitches to help with this, and pin every few millimetres until all the ease has fitted in. But these were particularly challenging! Does anyone have any better tips for working in the ease? Trying to pin out the sleeve ease…. I’ve splashed out a bit on the buttons and had them professionally covered in self fabric. I’ve used Harlequin before for making fabric belts and I’ve been wanting to use these eyelet buttons for a while and this dress seemed the perfect project. I need 11 buttons at £1.20 each but as the fabric was a bargain so I went for it. I think that £4.40 for the P&P is a bit steep but I had my mind set on them. The fabric is the Hemingway Designs that I bought on sale in John Lewis for £5 per metre at the beginning of the year. It feels like it’s the wrong end of the summer to be making this dress but add a cardi and opaque tights and it will work well into the autumn. Anyone else set themselves the challenge?